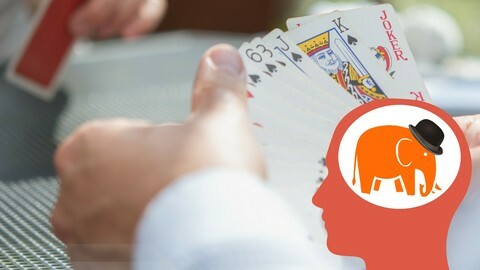 This course is the sixth in the series “The Memory Experts’ Tools” and is dedicated to the playing cards memorization. In this course, you will learn all advanced memory techniques used by the memory athletes and magicians, explained in detail and with many practical examples. You might be wondering : Why you would need to memorize playing cards? Unless you’re a magician or memory athlete, memorizing a deck of cards does sound like a meaningless skill, and you might even view it as a complete waste of time.However, memorizing long sequences of playing cards is still the best memory exercise ever. Being able to memorize a deck of cards can give you major advantages at card games like bridge, poker and blackjack. Imagine being able to memorize the order of cards in an entire deck as quickly as they can be dealt. Card counters use these memory techniques to earn considerable amounts of money at the blackjack table. No matter whether you want to become a magician, a casino card counter or a memory athlete, this course will give the right tools and methods to attain success in this field. In this course,each method and technique is explained in detail and with a lot of examples; you will see for yourself how just how simple and handy this skill is! You will also learn tips and tricks from the memory experts, to help you memorize playing cards more effectively. By applying the methods presented in this course and by doing a lot of training, more and more people around the world are able to memorize a deck of cards in 60 seconds or less. If you were waiting for the perfect time to begin your memory improvement journey,the time is now ! I’m sure you will love this course! Hi, my name is Chris M Nemo and I’m a memory improvement writer & blogger. I’m passionate about helping you to achieve more with your mind right now, regardless of your education, age, or other conditionings. After studying dozens of books, totaling some thousands of pages, dozens of hours of e-learning courses, and of hundreds of hours of practical exercises in this field of memory improvement, I decided to share this knowledge with people interested in learning this skill. On my blog, ”The Mnemo Bay”, you can find an organized framework for everything related to memory improvement, which can give you a clear picture of what this wonderful hobby and skill can do for your life.